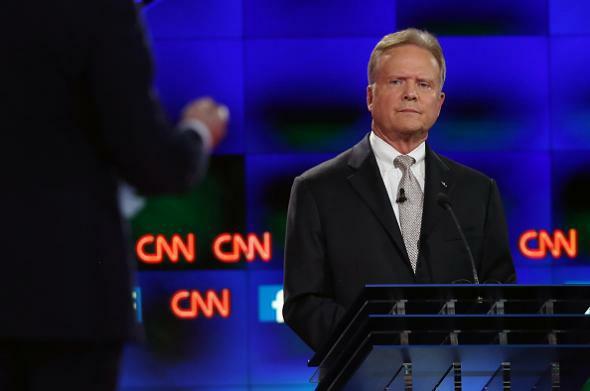 Jim Webb dropping out of Democratic race, might run as independent. Former Virginia Sen. Jim Webb at the Democratic debate in Las Vegas on Oct. 13, 2015. While Webb is thought to be weighing a possible independent bid, he is not expected to launch an independent campaign for president Tuesday. Rather, he’s expected to take some time after his announcement to talk with people from across the political spectrum before making a decision. Webb’s campaign for the Democratic nomination has been significantly less energetic than that of Hillary Clinton, Bernie Sanders, and former Maryland Gov. Martin O’Malley. He spent only $380,000 during the latest Federal Election Commission reporting period, or about one-sixth as much as his fellow long shot O’Malley. Webb hasn’t appeared in New Hampshire since announcing his campaign, and he doesn’t have a campaign office in either Iowa or New Hampshire. Candidate Webb will at the least be remembered for creating one of the most unusual moments in presidential debate history by casually alluding to having killed a Vietnamese soldier during last week’s Democratic event in Las Vegas.